Lemonade is just one of those things that signifies summertime. During the hot summer months I often find myself reaching for a tall ice cold glass of lemonade. 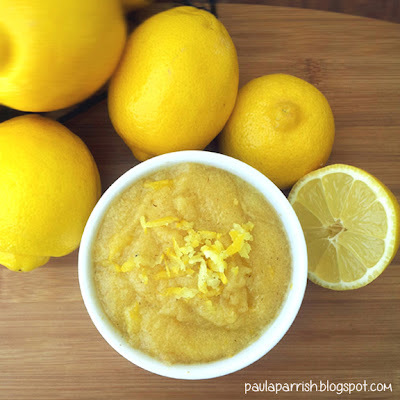 While sipping on my lemonade, I started thinking about how to make a Lemonade Body Scrub. 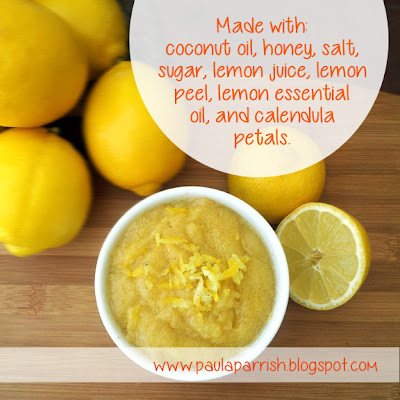 A perfect lemony coconut body scrub for the summertime. The ideal treatment to keep our skin in awesome condition for the beach and pool. As I am writing this post the “Lemonade, Crunchy Ice” song keeps popping into my head over and over again. Beat it once, beat it twice. Turn around, touch the ground, FREEZE. In a small bowl mix up the honey, lemon juice, lemon peel, essential oil and calendula petal powder. Once the first ingredients are completely combined toss in the sugar and salt, and mix well. 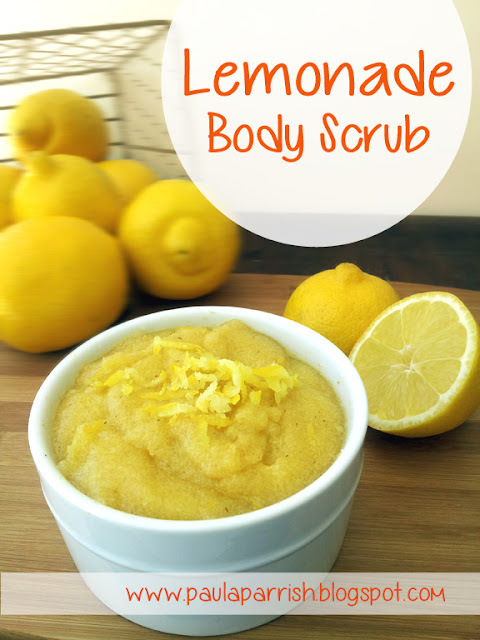 Gently Massage a quarter size amount of this homemade scrub into different areas of your body in the circular motion. Rinse well with warm water. Repeat this treatment once a week. The calendula flower has orange and yellow petals. Sometimes it is referred to as marigold. I added the calendula petal powder to this scrub as a natural yellow colorant, and because it is wonderful for the skin. Calendula petals are wonderful for stimulating collagen production, hydrating skin, and reducing the appearance of fine lines or wrinkles. I hope that you give this scrub a try, and enjoy the delicate summery scent. This lemony scrub is sure to reveal your skin's true radiance. I'm so excited, I have ALL the ingredients to make this awesome looking scrub! Yea! I'm going to try it today, love the recipe. I can almost smell that lemony goodness from here! That looks so good. Thank you for sharing your 'recipe'! Best wishes and thanks for dropping by today! Great ingredients in this scrub. That looks so refreshing...perfect for Summertime!! I believe that this body scrub would be to abrasive on your face. I would recommend making a ground oatmeal paste with oil and water for a face scrub. Thanks for stopping by and visiting my blog. How would you store this? I am thinking of making this for a bday gift for a friend. Store this homemade scrub in a jar with a tight fitting lid. So many good ideas on your blog! I want to do them all! Thank you for sharing this. is it possible to do this without the Calendula Petal Powder. I really can not find it where I am? Which preservative do you use for longer shelf life?